Upcycling projects are ever increasing in popularity because they’re good for the environment and good for your wallets. Wine bottles are one of the most popular items to upcycle, and we’ve gathered 40 different ways to reuse and repurpose them. Although this is a list of 40 upcycled wine bottle craft ideas, most of these projects can be done with any type of glass bottle. So grab your glass of wine, sit back, relax and browse this list for your next project! 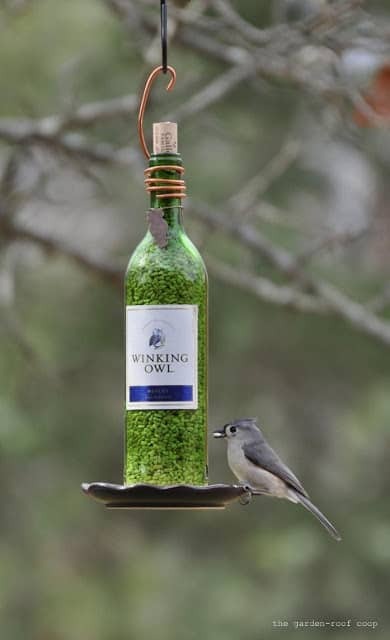 How adorable is this simple bird feeder project from The Garden-Roof Coop? Drill holes near the bottom for the food to come out, attach a plate to the very bottom so the birds have somewhere to perch, and wrap with copper wire to hang! This project is easily customizable by using different bottles, plates, and charms hanging on the copper wire. The Zen of Making shows you how to create these self-watering planters that make indoor gardening a breeze! You can find the instructions on how to make these cute frosted labelled bottles to keep your plants watered at Here Comes The Sun Blog. These cute tiered wine bottle wind chimes, by Design Originals, would also make a great addition to your outdoor garden. Turn wine bottles into bright and cheery painted vases with this quick and easy tutorial from Rustic Wedding Chic. If you prefer the look of something more translucent, you can find this tutorial on how to tint wine bottles over at It’s Overflowing. The best part is that it only requires mod podge, water, and food coloring! Get rid of that boring dish soap bottle and replace it with this cute frosted wine bottle soap dispenser! Find the tutorial over at Living Well Spending Less. Learn how to make these pretty hanging wine bottle candle holders. This video tutorial by Seven Seas DIY gives you detailed instructions from start to finish! Housewife’s Essentials shows you how to make these beautiful twine-wrapped wine bottles. Perfect shabby-chic home decor! Keep the bugs away while adding to the decor of your outdoor party with these cute citronella wine bottle candles from Hello Natural. Love Lenore shows you how to create these eye-catching glittered centerpieces. You could also use gold glitter, which would be perfect for a glam New Year’s Eve party! If you love the glittery bottles from #13, you’ll love this ombre glittered bottle tutorial from Vintage Movement. Cleverly Inspired has a great tutorial on how to create this gorgeous Christmas wine bottle display using Epsom salt! These uniquely textured bottles would also be a beautiful centerpiece for a winter-themed wedding! Speaking of Christmas, Wit and Whistle created this romantic wine bottle light using Christmas string lights. Find the tutorial here. Oregon Live shows you how wine bottles can also be used with a hanging light fixture to create a bistro-atmosphere in your dining room or kitchen! The Lettered Cottage has a great tutorial on how they created this Pottery-Barn-inspired wine bottle chandelier at a fraction of the cost! Create pretty painted vases to give as gifts with this tutorial from Tater Tots & Jello. This one comes with a free Mother’s Day printable! Like Vert Austin, you can use wine bottles as a border in your garden. It may take a while to collect all the bottles needed, but it will be well worth the effort! Follow along this video tutorial on YouTube as hENABLER creates this unique wine bottle water fountain. Thanks so much for featuring my wine bottle lamp tutorial! 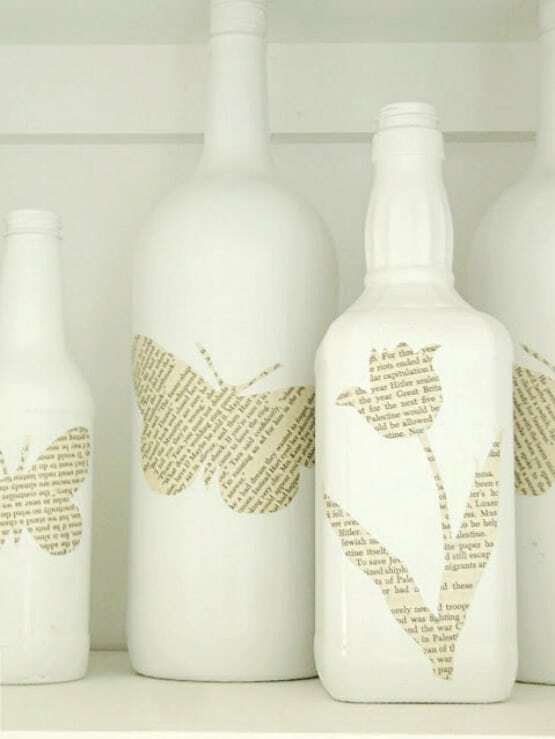 Great selections of ways to upcycle wine bottles! Awesome – spine tingling about covers it.